Mother dogs are very protective of their puppies. Pregnancy and puppy-raising can change the most even-tempered and loving dog into an unpredictable or even annoying pet. Luckily, the behavior of the mother dog will usually return to normal after her puppies become independent. Meantime, you can smooth the path for you and your pet by anticipating her behaviors. 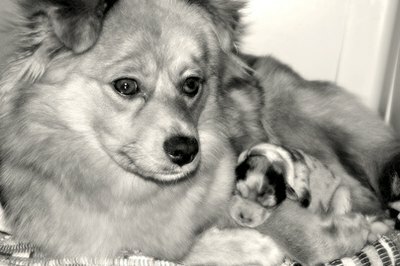 Before the puppies are born, a mother dog is likely to become more anxious and restless than usual. In late pregnancy, the mother dog may be in physical discomfort -- immediately before birth she will experience labor pains and contractions. Your dog may be more snippy with you than usual during this time. Make sure she has a quiet area and a clean, comfortable large box in which to give birth to the puppies. The birthing area should be away from other dogs and young children who may cause stress for the mother dog during birth. For the first three weeks after her puppies are born, the mother dog will pay undivided attention to her litter. She will probably pay less attention to you than is normal, and may snarl at -- or even attack -- a person who interferes with her puppies. Most of the mother dog's time and energy will be taken up with feeding, caring for and cleaning her puppies. Your dog may also be extremely tired as her body recovers from giving birth and her puppies disrupt her usual sleep patterns. 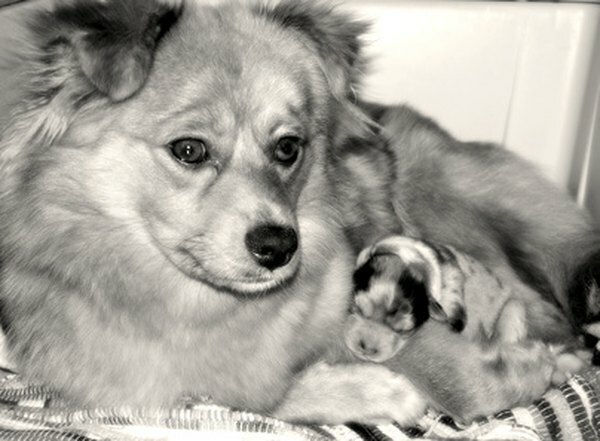 As the puppies get older and develop, the mother dog's behavior will change again. She will start to encourage the puppies to be more independent, usually encouraging them to play with other pets or humans in the family. In the first few weeks of nursing, the mother dog tolerated all the puppies' behaviors; after about three weeks she will typically start to discipline the puppies. The mother dog may growl, bark or even nip at a puppy who tries to nurse or nip at her. You might see the mother dog pick up a puppy by the scruff of the neck and shake it -- this is quite normal disciplining behavior. Keep your mother dog and her litter of pups separate from other dogs and children until you know how her behavior will develop. A mother dog may become aggressive towards another adult dog after giving birth -- even if the mother was previously housed with another female adult dog and the pair were close friends, this may change when one dog becomes a mother. In certain cases, a mother dog may become aggressive toward her own puppies. This most commonly happens when the puppies are born by Caesarean section, as this procedure deprives the mother of the usual scent and hormone-related clues that the litter of puppies belong to her. A mother dog who does not form a typical parental bond with her puppies may attack, neglect or even attempt to kill the puppies. Can You Take a Dog Away From Its Mom Before 6 Weeks? How Do Mother Dogs Punish Their Pups? Can Female Dogs Recognize Their Offspring in Later Years? When Do Puppies Stop Nursing From Their Mother? How Do Dogs Carry Their Puppies? How Often Do Newborn Puppies Eat? When Do Mama Dogs Lose Their Milk? Why Would a Mother Dog Reject a Newborn Puppy? How Do Mother Dogs Show Affection to Puppies?